March 12 2015: As a part of it’s CSR program and keeping alive it’s commitment towards helping the society, Al Nabooda Automobiles donated one ambulance each in Sharjah and Fujairah.The ambulance handover ceremony was presided by H.E. Khalifa Juma Al Nabooda, Chairman of Al Nabooda Automobiles and Mr. K. Rajaram, CEO Al Nabooda Automobiles. The ambulance in Sharjah was handed over to Sheikh Abdullah Bin Mohammed Al Thani and his son Sheikh Ahmad Bin Abdullah Al Thani who were kind to provide their support. 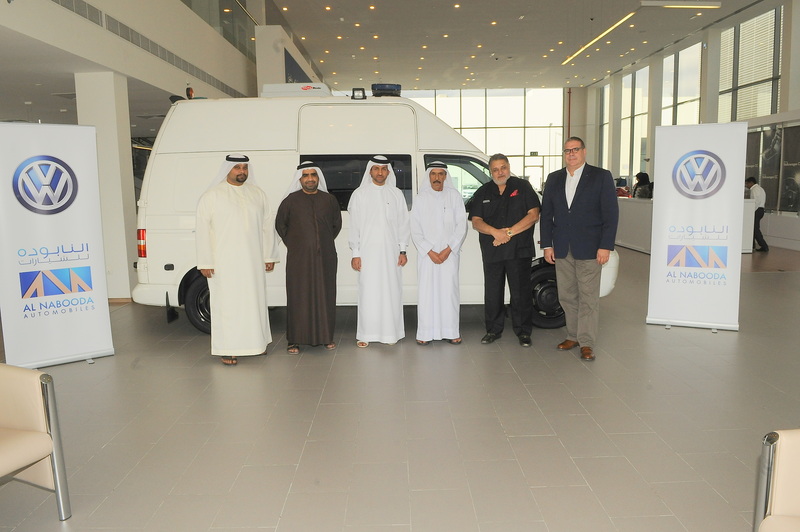 In Fujairah, Mr.Hamad Al Qabai from Fujairah Medical Zone, Mr. Mohammed Abdullah Saaed, Director Fujairah Medical Zone, Mr. Sultan Jumai, Deputy Director General at Fujairah Chamber of commerce & Industry received the ambulance. From Left to Right: Mr. Moutaz Siyam, Fleet & Commercial Sales Manager, Volkswagen Al Nabooda Automobiles, Sheikh Ahmad Bin Abdullah Al Thani, H.E. Khalifa Juma Al Nabooda, Chairman of Al Nabooda Automobiles, Sheikh Abdullah Bin Mohammed Al Thani, Thierry Seys, General Manager, Volkswagen Al Nabooda Automobiles, Mr. K. Rajaram, CEO, Al Nabooda Automobiles, Mr. Ahmad Al Jamri, Deputy General Manager Customer Relations/Govt & Legal Affairs, Al Nabooda Automobiles. From Left to Right: Mr.Hamad Al Qabai from Fujairah Medical Zone,Mr. Mohammed Abdullah Saaed, Director Fujairah Medical Zone,Mr. Sultan Jumai,Deputy Director General at Fujairah Chamber of commerce & Industry,H.E. Khalifa Juma Al Nabooda, Chairman of Al Nabooda Automobiles,Mr. K. Rajaram, CEO Al Nabooda Automobiles, Mr. Thierry Seys, General Manager, Volkswagen Al Nabooda Automobiles.